A 1 of 3 prototype 1985 Pontiac Trans Am Kammback will come up for auction in January 2019 at Mecum, Kissimmee. 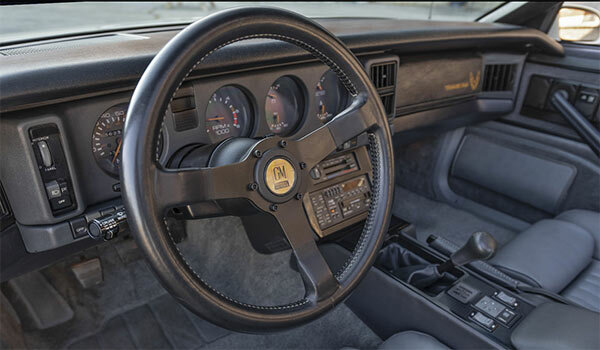 This shooting brake type design was only one of three and after doing the rounds at a few Auto Shows and as a pace car at the PPG and IMSA race series, VIN EX4796 was put in Pontiac Engineering’s car collection for the next 13 years. The car survived the fate of many prototypes by being saved from the crusher from Detroit-area Pontiac dealer and collector John McMullen. The car was professionally restored by Scott Tiemann’s Supercar Specialties and sold to the John O’Quinn Collection in 2007. Designwise, it’s got that 80’s front end look, with a more practical rear, featuring a 5.0-liter H.O. V8 engine and a five-speed manual transmission. It also has power steering, Glass T-Tops, padded Formula steering wheel, Dove Grey leather-trimmed interior and curved glass rear windows. It’s in good enough condition and rare enough to have been featured at Concours d’Elegance and Muscle Car and Corvette Nationals in Chicago. A unique example of one of General Motors test mules and demonstration vehicles. Interestingly, the Kammback came up for auction at Barrett Jackson at the beginning of 2017 wanting $44,000.